Social work has always been a contested activity and its status as an academic discipline remains uncertain. 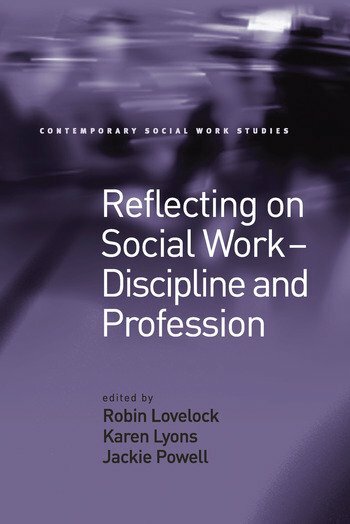 There is currently renewed interest in the theoretical and research dimensions of social work, at a time when significant changes in the broad social, political and economic context in which practice takes place require a re-evaluation of social work's role and a re-examination of its identity. This timely book brings together leading social work academics to examine the state of social work at the beginning of the 21st century. With their focus on the relationships between research, theory and practice, they reflect critically on the nature of social work as a discipline in higher education and the importance of this to the profession as a whole. The book represents an exploratory conversation among social work academics about the current state and future aspirations of the discipline and the profession. It aims to stimulate wider debate about the dominant constraints and opportunities for social work in the 21st century. Contents: Introduction, Jackie Powell, Robin Lovelock and Karen Lyons; Social work, the public sphere and civil society, Bill Jordan and Nigel Parton; The McDonaldization of social work - or 'Come back Florence Hollis, all is (or should be) forgiven', Adrian L. James; The politics of social work research, Ian Butler and Richard Pugh; Gender and knowledge in social work, Karen Lyons and Imogen Taylor; Social work research and the partnership agenda, Steve Trevillion; Taking sides: social work research as a moral and political activity, Beth Humphries; Qualitative research and social work: the methodological repertoire in a practice-oriented discipline, Nick Gould; Research as an element in social work's ongoing search for identity, Walter Lorenz; 'Knowing how to go on': towards situated practice and emergent theory in social work, Jeremy Kearney; Habermas/Foucault for social work: practices of critical reflection, Robin Lovelock and Jackie Powell; Index. Robin Lovelock is a Visiting Senior Research Fellow at the University of Southampton, UK, Karen Lyons at the London Metropolitan University, UK and Jackie Powell is a Reader in Social Work Studies at the University of Southampton, UK.